This item is currently out of stock. It may take 6 or more weeks to obtain from when you place your order as this is a specialist product. 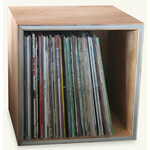 Vinyl is back and The Record Box is the ideal storage solution! The oiled timber finish and brushed aluminium front trim looks great in any room. Each Record Box will store at least 80 LPs. They are stackable so will keep expanding collections well under control. Please note that shipping is additional and not automatically calculated, please inquire if you require delivery.